Toop&Toop Blog: Everybody's talking about it…but now is the time to make a move! Everybody's talking about it…but now is the time to make a move! Often there is a lot of talk about purchasing property and not a lot of action. I'm as guilty of this as anyone. I've been looking for my second investment property since September and I'm certain now is the time to get involved, provided you buy well—yet I'm still shopping around. With an 80% auction clearance rate last week, we knocked Sydney off the top of the list for the first time in more than six months—and in turn achieved the highest clearance rate in the nation! Adelaide's average time on market for houses has decreased by 11% since September alone. 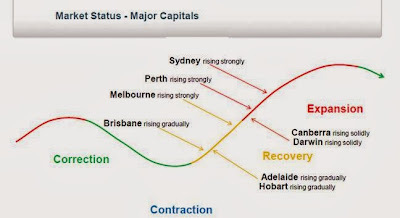 Looking at the current real estate cycle, according to Australian Property Monitors (APM), Adelaide has come off the bottom and is in the Recovery phase. Sydney is charging ahead with double digit growth and is well into the Expansion stage. What does this all mean? It means that Adelaide is the box seat for investors or purchasers who are seeking capital growth—now is the time to act! Not only are the residential stats telling us things are ticking over well, the lenders are fighting for market share. This is a tell-tale sign that the market is active and everyone wants a piece of it. The battle for lenders has escalated since the start of spring according to brokers, banks and market observers…even the 'Big 4' are being aggressive. Wealth Management companies across Australia have noticed that the level of discounting has increased with up to 100 basis points being knocked off the borrowing rate. What type of savings does a 1.0% discount pass on? With a $500,000 loan size you would reduce payments by $3,540 a year and $88,500 over 25 years. This is no small drop in the ocean. RP Data's latest report shows that Adelaide's mortgage activity is growing steadily month-on-month and is significantly higher than what we saw back in August. This is consistent with the feedback from lenders in the market. After chatting with CommSec's Savanth Sebastian last week about consumer sentiment and his thoughts on the current market, theory and gut feel are telling me it's time to get serious about purchasing. The signs are saying now is the time to jump in and negotiate hard on home loans, particularly if you are taking out a substantial mortgage or are dealing with the smaller lenders. Be strategic and talk to a number of lenders to find out what the best rates out there are. Often seeing a mortgage broker is the simplest way to go as they are in the game and know what deals are around. Since September, I've changed gear and am taking a piece of my own advice. I have booked an appointment with my mortgage broker this week…I'm hoping to make the most of these lending conditions and know with Adelaide's steady long term market growth, getting involved is better than sitting on the sidelines. It's time to make the jump! Where are these houses for sale that all the investors will buy? Not much around for sale, massive shortage of stock. More investors = less home owners.